1) HW251 SupraPlus – The HW251 is made for that quiet office environment and gives you the best sound quality. 2) HW251N SupraPlus – Our best-selling headset, the HW251N is intended for call centers and smaller offices that have a loud noise level. 3) HW261N SupraPlus – The HW261N headset is intended for a loud environment where you need to concentrate on your call and not on what’s going on around you. The noise-canceling microphone will help muffle the background noise, so it’s not passed on to your customer. 4) HW291N Encore – With its padded ear cushion for comfort and the telescoping microphone, so you can be heard loud and clear, you can’t go wrong. 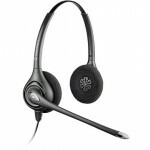 5) H81 TriStar – This headset offers superior voice tube technology, so you will always be heard loud and clear. It offers a quick-disconnect feature for anytime you need to get up and move away from your phone. If you’re deciding between corded models of headsets, it never hurts to see what the top five corded headsets from Plantronics are, because chances are other customers have purchased corded headsets and found what they liked and continue to purchase them. 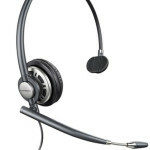 With the models listed above, they’re all top of the line business grade/professional grade corded headsets made by Plantronics that are durable, comfortable and built to last. Choosing any will increase your productivity by allowing you to be hands free while talking on the phone. Once you try a corded headset, you will find it hard to be without.